“Absolutely spot on. I've been doing book signings since 1990, and I thought I knew it all, but Adam Dreece's clear-headed guidelines taught me a lot. You can stumble through your public appearances -- or you can follow these excellent suggestions and make the most of every opportunity. Adam Dreece has become my guru for twenty-first century publishing." “As someone who has been stealing ideas from Adam for years, it’s great to see his knowledge and experience with bookselling distilled into this succinct, clever little book. Highly recommended.” —Luther M. Siler, author of The Benevolence Archives. "...intriguing contraptions, appealing characters, snide villains, humor, and an exciting story." Tee, Elly, and Richy peaceful little world is shattered when they become entangled in a plot to steal the world's first steam engine plans from master inventor, Nikolas Klaus. Will Klaus' ties to the secret society known as the Tub (lead by a butcher, baker, and candlestick maker) be their undoing? Or will they live on to become legends? Here are some of the amazing fairy tales, nursery rhymes, and classic stories woven into the fabric of The Yellow Hoods series: Little Red Riding Hood, The Three Little Pigs, Santa Claus, Hansel and Gretel, Rumplestilskin, Beauty and the Beast, Humpty Dumpty, Chicken Little, Alice in Wonderland, Simple Simon, Rub-a-dub-dub. The series grows in intensity as it goes and uses humor along the way. It has strong female characters, no graphic violence, no sexual content, and is loved by kids aged 9-15 and adults (written for both audiences). Loved by fans of Percy Jackson, Harry Potter, Ranger's Apprentice, and more. All books published by ADZO Publishing. Books 1 and 2 were also published in a collection called Gears and Goggles by Tyche Book’s imprint: Cornucopia Press. Read a few free chapters here. 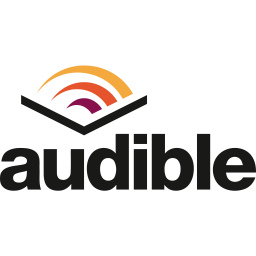 Gripping adventure, brilliant inventions, and snarky humor. Tee, Elly, and Richy peaceful little world is shattered when they become entangled in a plot to steal the world’s first steam engine plans from master inventor, Nikolas Klaus. Will Klaus’ ties to the secret society known as the Tub (lead by a butcher, baker, and candlestick maker) be their undoing? Or will they live on to become legends? In an act of desperation, inventor Maxwell Watt entrusts his son to secretly deliver plans for his completed steam engine to Nikolas Klaus, a master inventor in another kingdom. When the Fare, the nefarious secret society, learns the game-changing invention’s plans are en route, they accelerate their own scheme to neutralize Klaus on their path to reclaiming long-lost control over kingdoms. Meanwhile, after a decade of relative tranquility in Mineau, local children have started to go missing—again. Captain Archambault suspects the return of the disturbing and depraved Ginger Lady. With the help of Tee, Elly, and Richy—the Yellow Hoods—the search is on to find the missing children before it is too late. 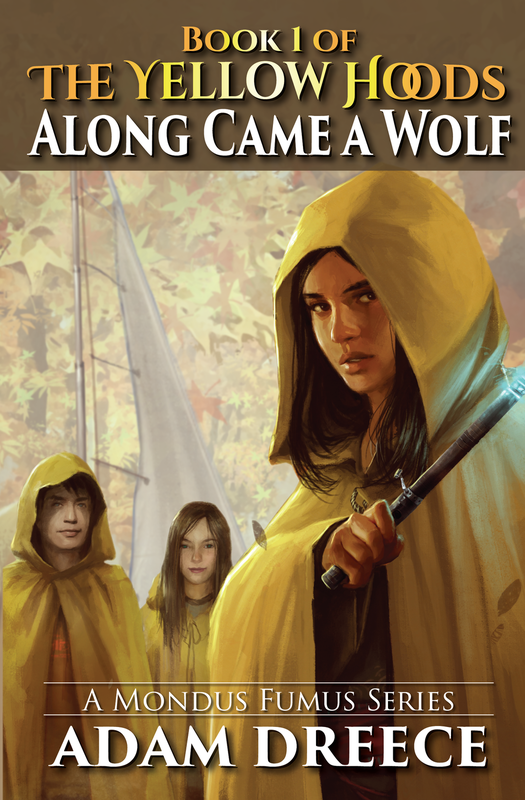 What is the secret that ties one of the Yellow Hoods to the Ginger Lady? Who are the Red Hoods? Enjoy this darker, edgier installment in the exciting emergent steampunk adventure series. 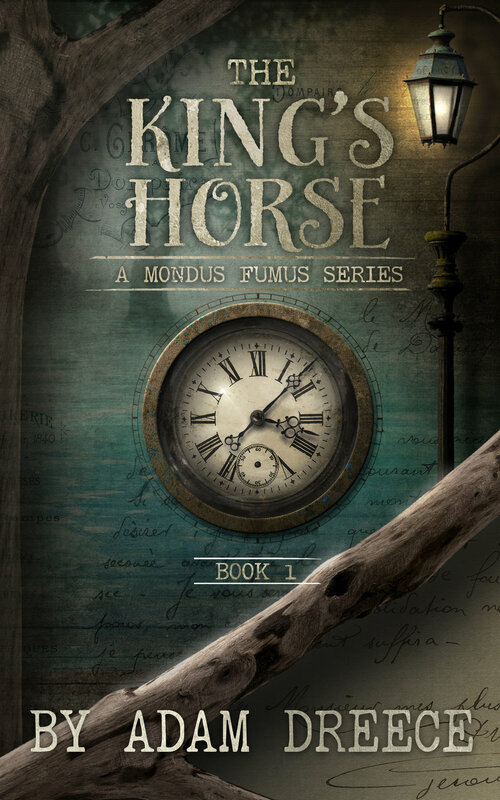 A companion story that sits between Breadcrumb Trail – Book 2 and All the King’s-Men - Book 3 from Adam Dreece’s new Mondus Fumus series, The King’s Horse. As the clockwork carriage shuttled along, Richelle Pieman’s mind was on the next step of their ambitious enterprise. Their nemesis, the secret society known as the Tub, had just been dealt a devastating blow, but was it going to be enough? All her life, Richelle followed in the footsteps of her grandfather, a true renaissance man and genius, but she was growing impatient. Eager for something new and different, life was about to give her exactly what she wished for. Careful what you wish for in this world of steampunk meets fairy tale, for Mondus Fumus is always listening. New edition (new cover plus previews of other books) 70 pages. Decades later, having taken control of the remains of the crushed Fare, a young Marcus Pieman follows up on rumors of a homeless, teenage Abominator in his city. When the scared Nikolas Klaus looked up at Marcus for the first time, a tremendous bond was forged. But has Nikolas been part of Marcus’ plans from the beginning? And has Marcus been a pawn of the original Fare the entire time? The Lady in Red’s revenge against the Piemans is nearly complete, and soon there will be no one to stop her. She’s ready for anything, except for the return of her long dead son. But is it really him? Tee watches as the airships rain down fiery destruction. She adjusts the rocket-pack’s leather straps and glances over her shoulder. Her friends might never forgive her, but she can’t stand idly by any longer. In a blink, she’s thrown into the air. Then, the unthinkable happens—the rocket-pack comes off. Who’s the new Yellow Hood? Who dies? And are the Piemans really down for the count? Beauties of the Beast continues the thrilling ride from All the King’s-Men and will have you punching the air with joy and biting your nails in angst. As the shepard watched the aerial bombardment of his village, he had no idea it would lead him to tip the scales in the war between Marcus Pieman and the Lady in Red. Meanwhile, with the meager remains of the Tub, the Yellow Hoods race to rescue Nikolas Klaus before it’s too late. Who will betray them, and who will be murdered? 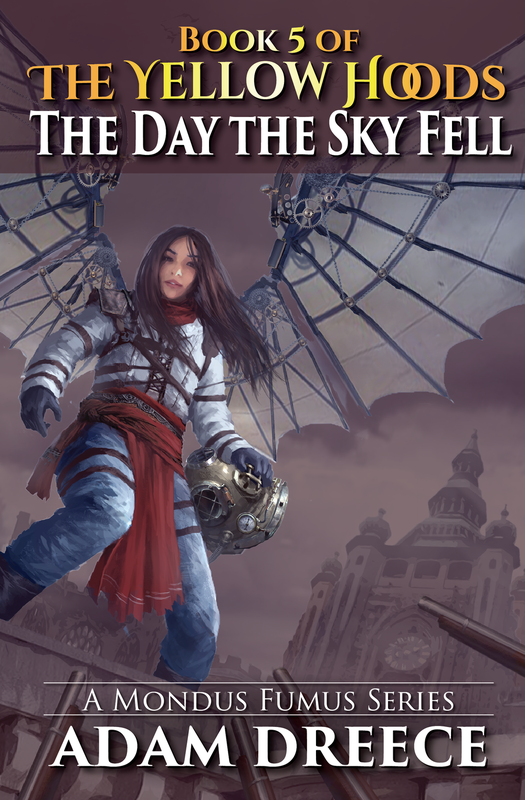 The Day the Sky Fell picks up where Beauties of the Beast left off, and brings an epic finale to the series. But is this truly the end of the Yellow Hoods? Find out! An all-new steampunk-meets-fairy-tale series of heart, legacy, and duty. Christina Creangle stared at the smoldering ruins of her life’s work. When the Moufan, an ancient secret society, offered to take care of her senile father as repayment of an old debt, she agreed. The idea of isolation with both her protege and her legendary inventor father, was too compelling to question. But the winds of history are blowing fierce after the first airship battle, spreading radical ideas to the ambitious and the fearful. Can the Moufan resist the temptation to use everything in their possession to seize power? Elsewhere, in the ruins of a presidential palace, an old, mechanical horse is discovered that could tip the continent’s delicate balance of power. From the world of the international best-selling series, The Yellow Hoods, comes an all-new series that weaves together Black Beauty, Humpty Dumpty, the Muffin Man, Santa Claus, and more. 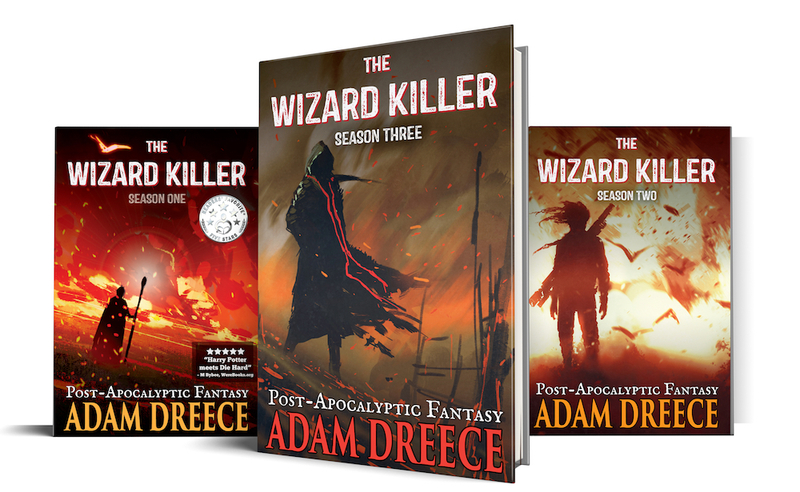 The Wizard Killer is an adrenaline, binge read, action series that takes place in Adam Dreece’s Mondus Inferno world.. Written in an episodic style, this first person, present tense, series has broken the mold when it comes to post-apocalyptic and fantasy stories. The world, once at the height of magical technology and social, order has collapsed. How and why are the least of the wizard killer’s worries. Leaning my bloody head against the back of the crashed levitating carriage, I flex my cramped fingers. With a renewed grip on the mana-pistol, I steal a quick breath. The others better wake up fast, otherwise we’re all going to burn. Enjoy the episodic-style, and an all new side to best-selling YA author, Adam Dreece. Season Two kicks everything up a notch with 22 all-new, action-packed episodes! The Wizard Killer – Season Two picks up where Season One left off. The past has a way of catching up with you. The random moments that flash by, the places you don’t remember being, the things you shouldn’t know but do, they’re all pieces of a puzzle you keep ignoring until it’s too late. Season Three returns us to the world of Mondus Inferno, and the plight of the man with no name, for the most soul-shattering season yet! As enemies betray their conscience, and allies their convictions, the man without a name finds his past and present on a collision course. 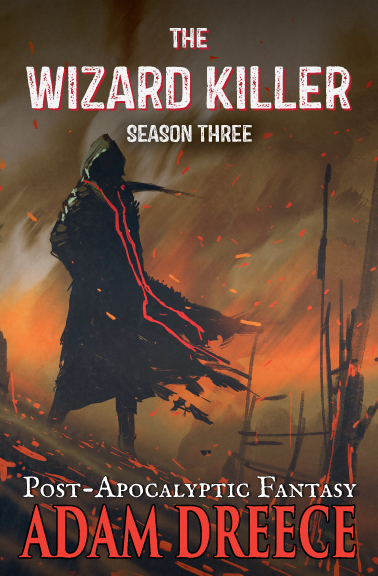 Strap in for the next exciting season of the Post-apocalyptic dark fantasy series, The Wizard Killer. In the late 21st century, brilliant inventor and entrepreneur Niko Rafaelo has revolutionized the world. His NanoCloud technology has restored society’s formerly insatiable appetite for innovation and big ideas. As the pressure builds to leak details about his latest prototype, Cloud 9, Niko finds himself pushed into a corner by the corporate behemoth he’s created. When the board of directors brings in Harriet Binger, old hatreds flare and a closely-guarded secret of Niko’s is exposed, motivating Harriet to destroy Niko completely. Will Niko sacrifice his vision in order to save those around him, or will he forfeit everything and everyone to see it realized? Don’t miss this all-new side of international best-selling author, Adam Dreece. You can you read free chapters of my books from WattPad, right here. I always have stories in the works, but some are closer to release than others. Here’s where you can find out about them, and catch a glimpse of the nearly-finished covers which I will quietly post here, along with a potential link for sample chapters. If you’re interested in being a beta-reader (i.e. someone who reads a pre-edited version of the story for the purposes of providing feedback), then fill in the form mentioned below! My Super-Secret Project, announced on social media in last 2018, will hopefully be finished in early 2019. Stay tuned to find out more about this Hitchhiker’s Guide to the Galaxy meets Guardians of the Galaxy series for all ages! My long-awaited new Gamer-Lit / RPG-Lit series that will have you shifting between the edge of your seat, laughing out loud, and waiting for the other shoe to drop. Space-Opera meets fantasy in my brand new series, Tilruna. Mixed into the heart of the story is Shakespeare’s Hamlet. 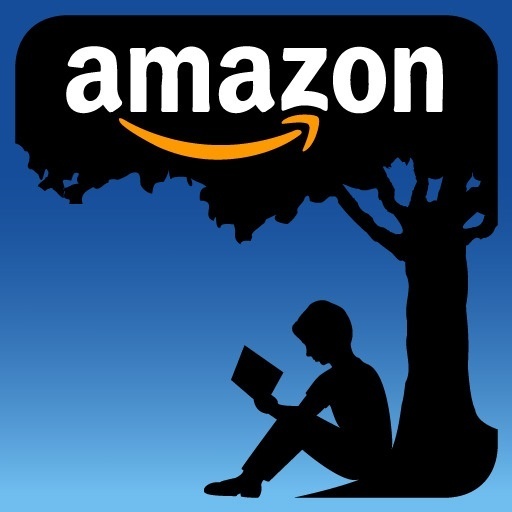 Would you like to be an early reviewer or beta-reader? Early reviewers help get the word out once the book’s complete and just as it’s being released. Beta-readers help provide concrete feedback that lets me know, as the author, what works, doesn’t, and what stands out before the story goes through final editing. If you’re curious about helping in either role, fill out the form and I’ll get back to you. Anything else you'd like to mention? Have you done this before for someone, for example?